In 1968, Britain announced its intention to withdraw from the Gulf. Ahmad and Khalifa seemed in favour of joining the other sheikhdoms of the southern Gulf in what was to become the United Arab Emirates. 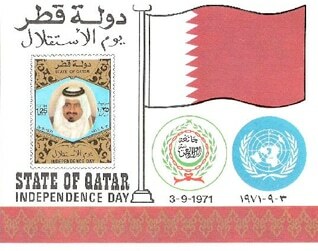 But Khalifa changed his mind and on 1 September 1971 Qatar became an independent state. Ahmad, now Emir of Qatar, did not return from Switzerland to attend the celebrations. On 22 February 1972, while hunting in Iran, he was informed that his cousin had deposed him. 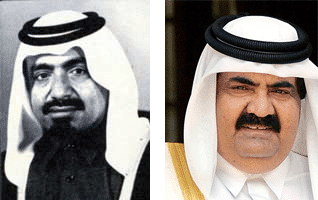 Khalifa bin Hamad broke with Ahmad’s policy of buying off the family at the cost of national development. He cut back family allowances and increased state spending. Rising oil prices and the nationalization of the oil industry in 1976 allowed him to invest heavily in education, health care and the creation of state jobs for Qatari nationals. A benevolent welfare state was born, coupled with an increasingly uncontrollable bureaucracy. 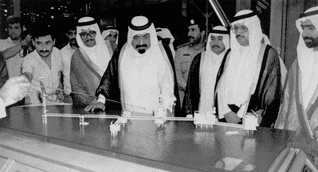 In May 1989, a Supreme Council of Planning, presided over by Crown prince Hamad bin Khalifa, was formed. It aimed to reduce Qatar’s dependence on oil through industrial diversification and agricultural development. But its only fruit was the costly development of an immense offshore gas field to the north of Qatar. When production from the so-called North Field started in 1991, dependence on oil was only partly exchanged for dependence on gas. Khalifa’s rule also brought some political reform. He established an Advisory Council, whose members he personally elected. 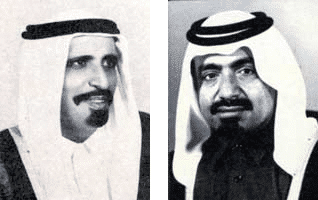 Ahmad’s supporters in government and bureaucracy were replaced by Khalifa’s allies. Khalifa’s position therefore seemed secured, but when oil revenues dropped, discontent resurfaced. On 27 June 1995, Hamad bin Khalifa deposed his father in a bloodless coup. The modern minded Hamad, who had received a military education at British Sandhurst, was warmly welcomed by Britain and America. Saudi Arabia and the UAE, which had favoured his more traditional, Islamic oriented father, were less amused. A year later, Hamad survived a counter-coup plot. Arrests followed quickly, and in 2001 nineteen defendants – all from Qatar – were sentenced to death. Although it is generally assumed that Khalifa bin Hamad was among the plotters, Hamad and his father officially reconciled some months after the ‘incident’. However, Khalifa did not return to Qatar until 2004.